The European Research Council (ERC) provides competitive funding to outstanding researchers undertaking curiosity-driven, high risk high gain basic research with the potential to open up new frontiers in science. Proposals are accepted from all scientific disciplines following a bottom-up principle. The major criterion during the evaluation process is excellence. 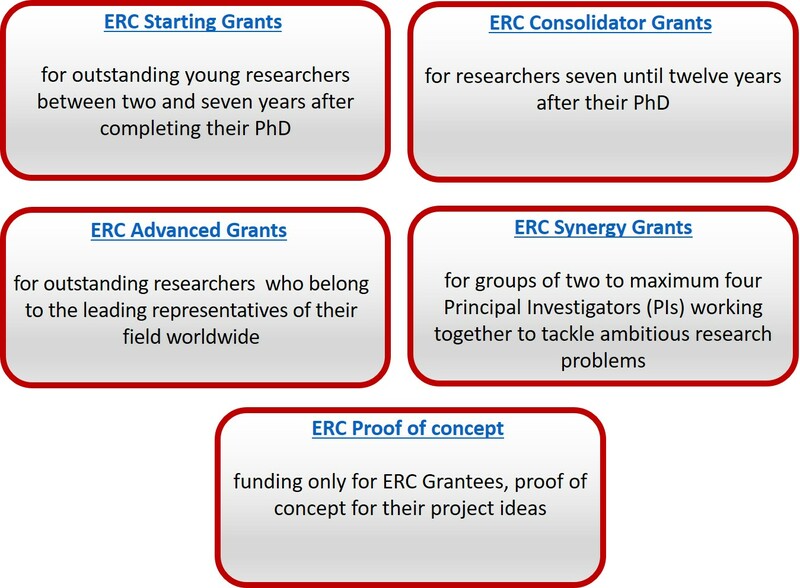 An ERC Grant is a great honor both for you, the applicants, as well as for JGU. It acknowledges that you belong to the leading representatives of your discipline (Consolidator and Advanced Grants) or that your have the potential to achieve this (Starting Grants). The EU-Office supports your application throughout the whole application process. Therefore we kindly ask you to contact us at least four weeks before the deadline. Your institute and department also need to support your application (Pilot FB 08: Formblatt Ressourcen). We can prepare the Commitment of the Host Institution. It can only be issued by us. The sample shown here is meant for information only. the National Contact Point ERC. Please also visits the ERC video channel which provides a lot of useful clips.